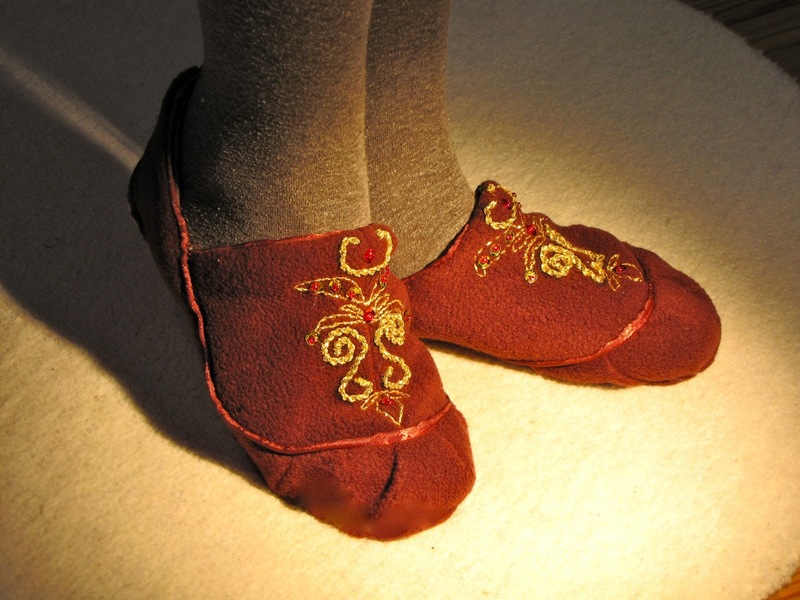 As promised, here comes my post about how to make your own shoes! It must be from the 40's, by the look of it (the print), the aesthetics and the content. It is called "Die Schuhnot" which translates basically into "Shoe Shortage", and teaches how women could make their own shoes with left-over materials they had at hand - torn clothes, fabric scraps, pieces of leather, twine, cardboard. It is mainly about making house shoes, but in the second part, there are definitely some that could be used outside, too. UPDATE: A dear reader commented that the booklet could actually be from the time of the first world war, and she is probably right. 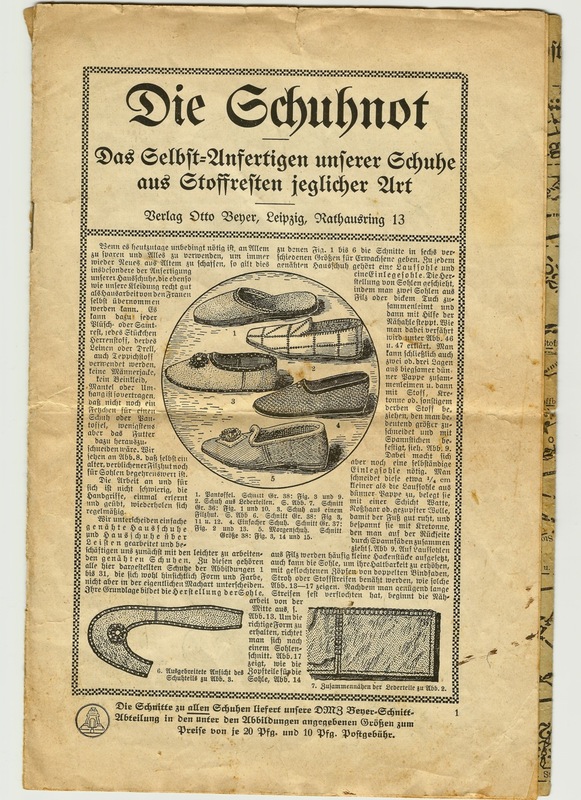 Even though I have to say some of my pattern magazines from the late 30's and early 40's still do use the old print (Frakturschrift - anyone know this term in English? 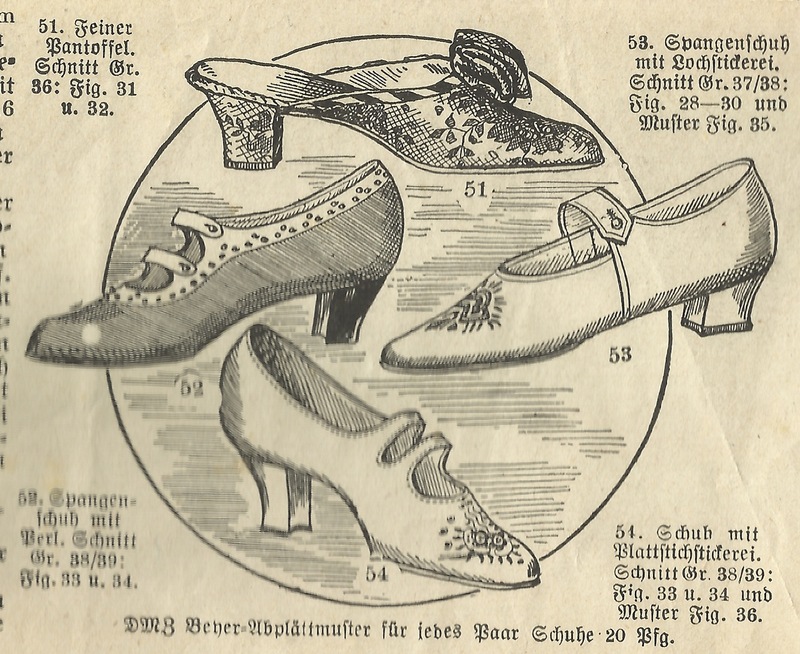 ), the shoe styles of the booklet are a pointer to the late 1910's, right? The historical context this booklet stands in is certainly a grim one, but I assume that many of you understand my excitement about finding it. I am all about making things myself, I love to learn new techniques, I am interested in everything that is far away from todays "cheap thrills with poor quality majority of consumption generation". This is very much along the lines of the "go slow clothes movement" - have you seen that new button in the right column on my blog? 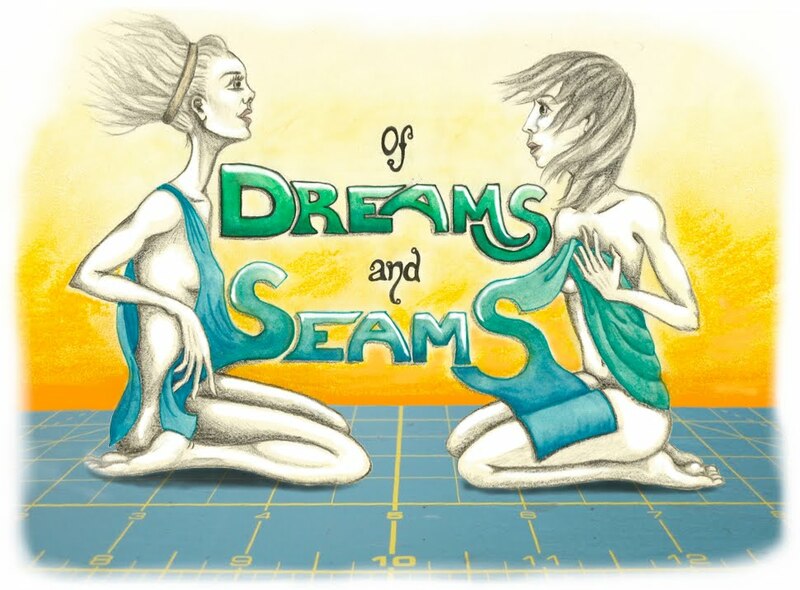 If you want to join the movement, you can go grab it at Charlottes Blog "sew far sew good"! Isn't it lovely? And honestly, which woman doesn't get excited about the thought of making her own shoes?! The booklet is divided up into two parts on eight pages and is packed with information. 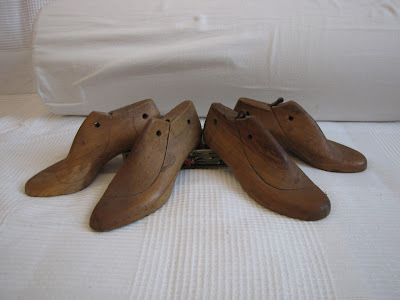 The first part is about how to make shoes using patterns (there is a separate pattern page, printed on both sides), the second part is how to make them using cobbler bars (at least I think that is the term?). And you better believe it, I bought two pairs! One a bit pointier than the other and with a somewhat higher heel. If you are interested, you need them one size smaller than your actual shoe size. I just think they are beautiful! Anyway, I have also ordered an awl, but it will actually be a while until I need that kind of advanced equipment. I will work this booklet from front to back, and it starts with the easier things. They give you different sizes soles patterns and a few examples of shoe patterns to go with it - the kind you just sew together. 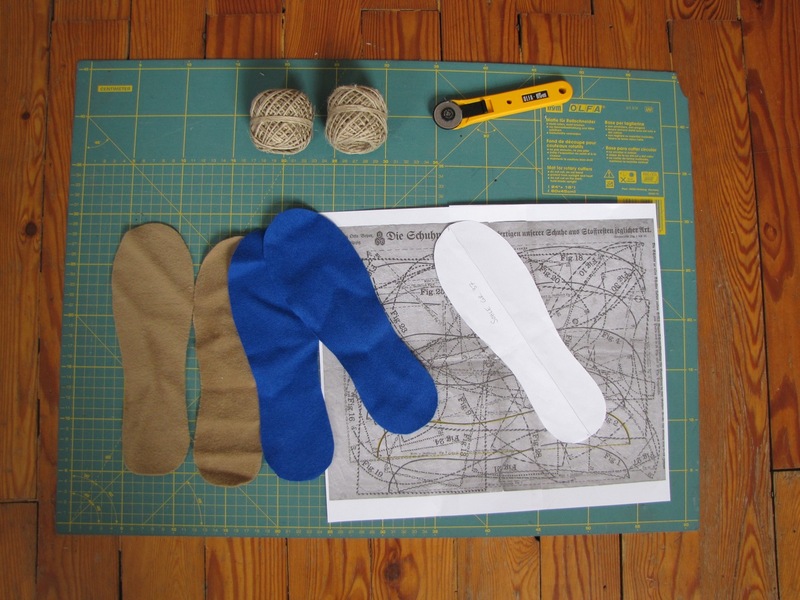 It begins with different options of how to make soles, which is a key element. 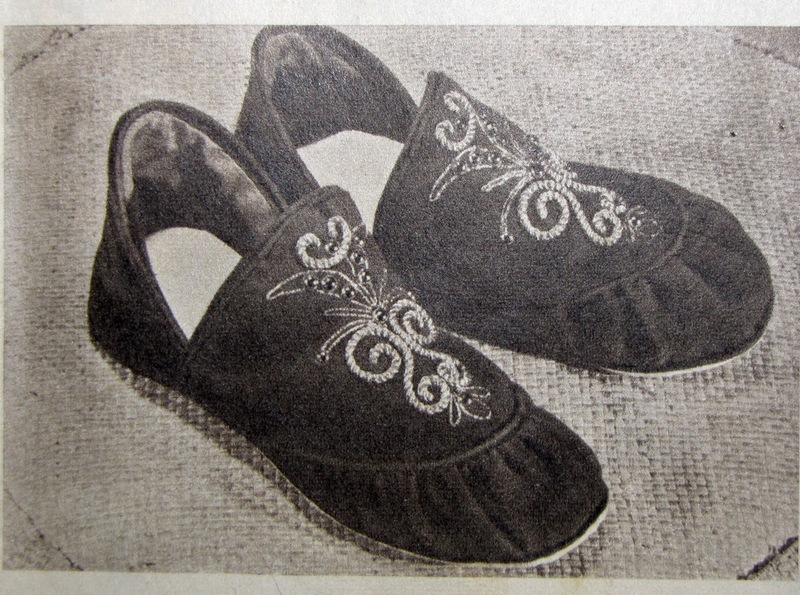 I once experimented with making shoes, house shoes, that is, from the 50's I believe.They turned out sort of cute, but the soles were a disaster. I used a Non Slip Rubber Kitchen Drawer Liner Mat (what a term!) and felt really smart about it, but it was difficult to sew without tearing, and didn't last long at all. I also used the wrong materials all together, but because I still sort of liked them, I am excited even more about learning how to do it right this time around. Soles are always made of an insole and an outer sole. One way of making the outer sole is sewing four-strand-braids made from twine to fabric soles. Yes, very much like the Espadrilles that are still sold all over the world every summer. 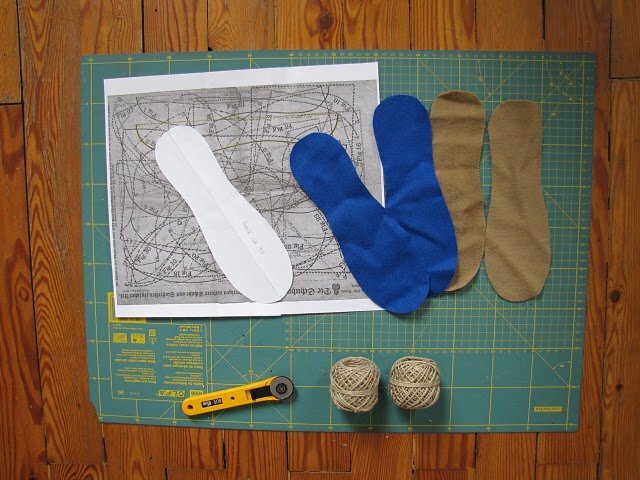 You cut two pairs of fabric soles (from felt or a sturdy cloth-type fabric), which you sew together using an awl. Alternatively, I stitched them together with blanket stitches. Then you make lots of loooong four-strand braids out of twine. And here comes the reason I wasn't able to post this yesterday yet: I decided to make a little video tutorial for the four-strand-braids, in case you need it (*proud*). Please excuse my sometimes lack of words - my English isn't perfect and my brain gets knotted up sometimes. I then layed the textile soles on a piece of Styrofoam, pinned the braids to it and started sewing. 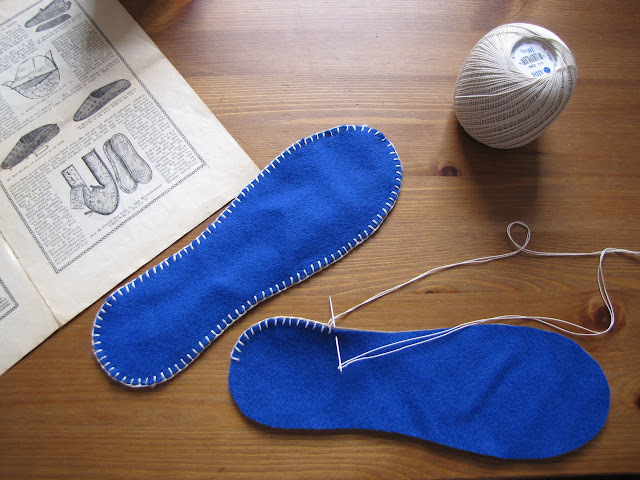 First you sew the braids into the right shape, then after that, you sew it to the textile soles. And because you are going "?" right now, I made another video showing you that, too. Again, please bear with me. These are my first two tutorial videos. I tried to keep them fairly short, yet be precise enough. Let me know if you have suggestions! The next posts about shoe making will be shorter. This one had a lot of introductory stuff, which of course will be omitted in the following ones! Up next: how to make the heel and sew the pieces together! Take care you crafters all over the world! This is great! Believe it or not, braiding four strands has bugged me since I was little. Thanks for posting! Sehr interessant, und vielen Dank, dass du eine ganze Serie daraus machst. An genähten Hausschuhen hatte ich mich schon einmal versucht, das Ergebnis war ok, aber nicht wirklich überzeugend, daher werde ich im Herbst sicher nochmal darauf zurückkommen. Also freu ich mich schon jetzt auf deine Tipps, wenn du das Heft durcharbeitest. Ich würde die Anleitung übrigens in die Zeit des 1. 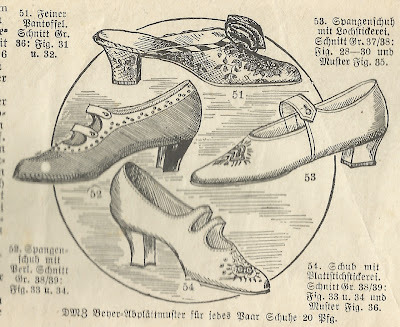 Weltkriegs datieren - da waren Schuhe ja genauso knapp. Ich habe einige Reprints von Beyer-Anleitungen von ca. 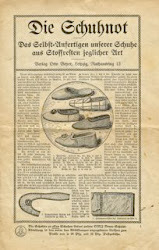 1910-1915, als man sich noch mit aufwendigen Handarbeiten beschäftigte, sie gleichen deinem Heft im Layout und im Stil der Illustrationen. Die Frakturschrift war im Buchdruck ab den 30er Jahren auch nicht mehr üblich. I agree, WWI or earlier :) Wonderful resource and thanks for this post! Vielen Dank schon einmal für diese Einblicke, das interessiert mich sehr. Im Winter hatte ich Schuhe nach einem Haushaltsbuch aus dem 19 Jhd. begonnen, aber noch nicht beendet. Außerdem war ich zwischenzeitlich im Schuhmuseum in Offenbach - ein Paradies für Inspirationen. Ich werde also mit Spannung deine Serie verfolgen und vielleicht auch noch einmal etwas dazu schreiben. Wonderful! What an amazing find, and thank you so much for those tutorial videos! (your English sounds flawless, by the way, and you don't stumble and hesitate any more than I would on a video). My 10 Piece Travel Set: 9 down, 1 to go! Me-Made-Mittwoch #12, hot off the sewing machine! A new shirt for Me-Made-Mittwoch #11!